Goal: To make the citizens of Venice respect the merchant Jews (namely, himself), to control all trade and commerce in Venice, to have the Three Billy Goats Troll punish the citizens of Venice by eating them if they do not do as he says. He also makes them eat nothing but goat meat. Abilities: Shylock found and placed on the Three Billy Goats Troll’s head his own red cap, to enslave the monster and have him do his bidding. The troll isn’t dumb but he is used for his brute strength. 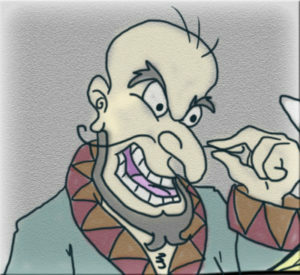 Shylock’s intelligence and shrewd demeanor make him a worthy adversary. Weakness(s): Shylock is very smart but his hatred and desire for revenge often blind him. Also, he felt he was so powerful that nothing could best him or the troll in his control.